Temporomandibular joint dysfunction (TMD, TMJD) is an umbrella term covering pain and dysfunction of the muscles of mastication (the muscles that move the jaw) and the temporomandibular joints (the joints which connect the mandible to the skull). The most important feature is pain, followed by restricted mandibular movement, and noises from the temporomandibular joints (TMJ) during jaw movement. Although TMD is not life-threatening, it can be detrimental to quality of life, because the symptoms can become chronic and difficult to manage. TMD is a symptom complex rather than a single condition, and it is thought to be caused by multiple factors. However, these factors are poorly understood, and there is disagreement as to their relative importance. There are many treatments available although there is a general lack of evidence for any treatment in TMD, and no widely accepted treatment protocol. Common treatments include provision of occlusal splints, psychosocial interventions like cognitive behavioral therapy, and pain medication or others. Most sources agree that no irreversible treatment should be carried out for TMD. About 20% to 30% of the adult population are affected to some degree. Usually people affected by TMD are between 20 and 40 years of age, and it is more common in females than males. TMD is the second most frequent cause of orofacial pain after dental pain (i.e. toothache). TMD is considered by some to be one of the 4 major symptom complexes in chronic orofacial pain, along with burning mouth syndrome, atypical facial pain and atypical odontalgia. TMD has been considered as a type of musculoskeletal, neuromuscular, or rheumatological disorder. It has also been called a functional pain syndrome, and a psychogenic disorder. Others consider TMD a "central sensitivity syndrome", in reference to evidence that TMD might be caused by a centrally mediated sensitivity to pain. It is hypothesized that there is a great deal of similarity between TMD and other pain syndromes like fibromyalgia, irritable bowel syndrome, interstitial cystitis, headache, chronic lower back pain and chronic neck pain. These disorders have also been theorized to be caused by centrally mediated sensitivity to pain, and furthermore they often occur together. Signs and symptoms of temporomandibular joint disorder vary in their presentation. The symptoms will usually involve more than one of the various components of the masticatory system, muscles, nerves, tendons, ligaments, bones, connective tissue, or the teeth. •	Pain and tenderness on palpation in the muscles of mastication, or of the joint itself (pre-auricular pain – pain felt just in front of the ear). Pain is the defining feature of TMD and is usually aggravated by manipulation or function, such as when chewing, clenching, or yawning, and is often worse upon waking. The character of the pain is usually dull or aching, poorly localized, and intermittent, although it can sometimes be constant. The pain is more usually unilateral (located on one side) rather than bilateral. It is rarely severe. •	Limited range of mandibular movement, which may cause difficulty eating or even talking. There may be locking of the jaw, or stiffness in the jaw muscles and the joints, especially present upon waking. There may also be incoordination, asymmetry or deviation of mandibular movement. •	Noises from the joint during mandibular movement, which may be intermittent. Joint noises may be described as clicking, popping, or crepitus (grating). •	Headache (possibly), e.g. pain in the occipital region (the back of the head), or the forehead; or other types of facial pain including migraine, tension headache. or myofascial pain. •	Pain elsewhere, such as the teeth or neck. •	Diminished auditory acuity (hearing loss). •	Sensation of malocclusion (feeling that the teeth do not meet together properly). TMD is a symptom complex (i.e. a group of symptoms occurring together and characterizing a particular disease), which is thought to be caused by multiple, poorly understood factors, but the exact etiology is unknown. There are factors which appear to predispose to TMD (genetic, hormonal, anatomical), factors which may precipitate it (trauma, occlusal changes, parafunction), and also factors which may prolong it (stress and again parafunction). Overall, two hypotheses have dominated research into the causes of TMD, namely a psychosocial model and a theory of occlusal dysharmony. Interest in occlusal factors as a causative factor in TMD was especially widespread in the past, and the theory has since fallen out of favor and become controversial due to lack of evidence. In people with TMD, it has been shown that the lower head of lateral pterygoid contracts during mouth closing (when it should relax), and is often tender to palpation. To theorize upon this observation, some have suggested that due to a tear in the back of the joint capsule, the articular disc may be displaced forwards (anterior disc displacement), stopping the upper head of lateral pterygoid from acting to stabilize the disc as it would do normally. As a biologic compensatory mechanism, the lower head tries to fill this role, hence the abnormal muscle activity during mouth closure. There is some evidence that anterior disc displacement is present in proportion of TMD cases. Anterior disc displacement with reduction refers to abnormal forward movement of the disc during opening which reduces upon closing. Anterior disc displacement without reduction refers to an abnormal forward, bunched-up position of the articular disc which does not reduce. In this latter scenario, the disc is not intermediary between the condyle and the articular fossa as it should be, and hence the articular surfaces of the bones themselves are exposed to a greater degree of wear (which may predispose to osteoarthritis in later life). The general term "degenerative joint disease" refers to arthritis (both osteoarthritis and rheumatoid arthritis) and arthrosis. The term arthrosis may cause confusion since in the specialized TMD literature it means something slightly different from in the wider medical literature. In medicine generally, arthrosis can be a nonspecific term for a joint, any disease of a joint (or specifically degenerative joint disease), and is also used as a synonym for osteoarthritis. In the specialized literature that has evolved around TMD research, arthrosis is differentiated from arthritis by the presence of low and no inflammation respectively. Both are however equally degenerative.The TMJs are sometimes described as one of the most used joints in the body. Over time, either with normal use or with parafunctional use of the joint, wear and degeneration can occur, termed osteoarthritis. Rheumatoid arthritis, an autoimmune joint disease, can also affect the TMJs. Degenerative joint diseases may lead to defects in the shape of the tissues of the joint, limitation of function (e.g. restricted mandibular movements), and joint pain. Emotional stress (anxiety, depression, anger) may increase pain by causing autonomic, visceral and skeletal activity and by reduced inhibition via the descending pathways of the limbic system. The interactions of these biological systems have been described as a vicious "anxiety-pain-tension" cycle which is thought to be frequently involved in TMD. Put simply, stress and anxiety cause grinding of teeth and sustained muscular contraction in the face. This produces pain which causes further anxiety which in turn causes prolonged muscular spasm at trigger points, vasoconstriction, ischemia and release of pain mediators. The pain discourages use of the masticatory system (a similar phenomenon in other chronic pain conditions is termed "fear avoidance" behavior), which leads to reduced muscle flexibility, tone, strength and endurance. This manifests as limited mouth opening and a sensation that the teeth are not fitting properly. Persons with TMD have a higher prevalence of psychological disorders than people without TMD. People with TMD have been shown to have higher levels of anxiety, depression, somatization and sleep deprivation, and these could be considered important risk factors for the development of TMD. In the 6 months before the onset, 50–70% of people with TMD report experiencing stressful life events (e.g. involving work, money, health or relationship loss). It has been postulated that such events induce anxiety and cause increased jaw muscle activity. Muscular hyperactivity has also been shown in people with TMD whilst taking examinations or watching horror films. Others argue that a link between muscular hyperactivity and TMD has not been convincingly demonstrated, and that emotional distress may be more of a consequence of pain rather than a cause. Bruxism is an oral parafunctional activity where there is excessive clenching and grinding of the teeth. It can occur during sleep or whilst awake. The cause of bruxism itself is not completely understood, but psychosocial factors appear to be implicated in awake bruxism and dopaminergic dysfunction and other central nervous system mechanisms may be involved in sleep bruxism. If TMD pain and limitation of mandibular movement are greatest upon waking, and then slowly resolve throughout the day, this may indicate sleep bruxism. Conversely, awake bruxism tends to cause symptoms that slowly get worse throughout the day, and there may be no pain at all upon waking. The relationship of bruxism with TMD is debated. Many suggest that sleep bruxism can be a causative or contributory factor to pain symptoms in TMD. Indeed, the symptoms of TMD overlap with those of bruxism. Others suggest that there is no strong association between TMD and bruxism. A systematic review investigating the possible relationship concluded that when self-reported bruxism is used to diagnose bruxism, there is a positive association with TMD pain, and when more strict diagnostic criteria for bruxism are used, the association with TMD symptoms is much lower. Self-reported bruxism is probably a poor method of identifying bruxism. There are also very many people who grind their teeth and who do not develop TMD. Bruxism and other parafunctional activities may play a role in perpetuating symptoms in some cases. Other parafunctional habits such as pen chewing, lip and cheek biting (which may manifest as morsicatio buccarum or linea alba), are also suggested to contribute to the development of TMD. Other parafunctional activities might include jaw thrusting, excessive gum chewing, nail biting and eating very hard foods. Trauma, both micro and macrotrauma, is sometimes identified as a possible cause of TMD; however, the evidence for this is not strong. Prolonged mouth opening (hyper-extension) is also suggested as a possible cause. It is thought that this leads to microtrauma and subsequent muscular hyperactivity. This may occur during dental treatment, with oral intubation whilst under a general anesthetic, during singing or wind instrument practice (really these can be thought of as parafunctional activities). Damage may be incurred during violent yawning, laughing, road traffic accidents, sports injuries, interpersonal violence, or during dental treatment, (such as tooth extraction). It has been proposed that a link exists between whiplash injuries (sudden neck hyper-extension usually occurring in road traffic accidents), and the development of TMD. This has been termed "post-traumatic TMD", to separate it from "idiopathic TMD". Despite multiple studies having been performed over the years, the cumulative evidence has been described as conflicting, with moderate evidence that TMD can occasionally follow whiplash injury. The research that suggests a link appears to demonstrate a low to moderate incidence of TMD following whiplash injury, and that pTMD has a poorer response to treatment than TMD which has not developed in relation to trauma. Left temporomandibular joint, lateral view. 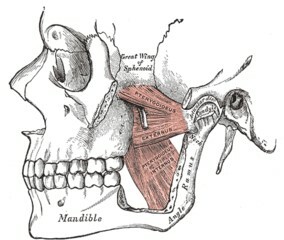 Left TMJ, medial view, showing sphenomandibular and stylomandibular ligaments. Sagittal TMJ cross-section showing articular eminence, articular disc, and upper and lower joint spaces. The muscles of mastication are paired on each side and work together to produce the movements of the mandible. 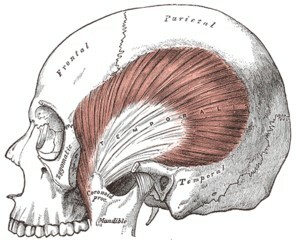 The main muscles involved are the masseter, temporalis and medial and lateral pterygoid muscles.